Dan Murphy’s practice has focused exclusively on healthcare transactional and regulatory matters for the past decade. He has represented all types and sizes of healthcare providers, from publicly-traded national hospital, dialysis, and ambulatory surgery center companies, to independent surgery centers and pharmacies, physician practices, and individual physicians. In representing providers, Dan brings a holistic view to healthcare deals and compliance issues that incorporates an understanding of state certificate of need and licensure laws, federal and state fraud and abuse laws (including Stark and the Anti-Kickback Statute), Medicare enrollment and reimbursement, and managed care contracting. He is able to structure and negotiate deals for his clients, as well as provide advice on compliance matters, with a deep understanding of the linkages among the many federal and state laws that can apply to a specific transaction or regulatory issue. Dan’s experience, prior to practicing law, as a senior financial analyst for Baxter Healthcare Corporation gives him a valuable perspective on the operational, financial, and strategic issues facing his clients. During his three years at Baxter, he worked in Vienna, Austria to assist with the integration of a large biopharmaceutical company acquisition, primarily operating in the German language. Dan’s work at Baxter also included roles as the primary financial analyst providing budgeting, strategic planning, and financial analysis for several business units with over $100 million in annual revenue. 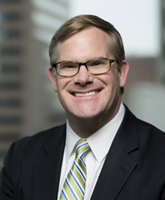 In addition to his experience at Baxter, Dan practiced international trade law in the Washington, D.C. office of White & Case LLP before becoming a healthcare lawyer. Before attending law school, he received a Fulbright teaching assistantship in Vienna, Austria. As an undergraduate, he served as the President and Pipe Major of the Notre Dame Bagpipe Band in South Bend, Indiana.